Having worked in a dozen such companies, I think both assumptions are flawed. Humans are not good at spotting interesting trends, yet for all but the highest scale web businesses, the problem is not really a ‘big data’ challenge. For a mid-sized business, the problem is best framed as, how do you extract regular, easy-to-absorb knowledge from an incomplete online behavioural data set, and how do you present / visualise the insight in such a way that digital managers can act on that insight? Information is what Google Analytics excels at providing an endless variety of charts and tables to query on mass the individual events. Yet in the traditional company process, it needs a human analyst to sift through those reports to spot problems or trends and yield genuine knowledge. And this role requires huge tolerance for processing boring, insignificant data – and massive analytical rigour to spot the few, often tiny, changes. Guess what? 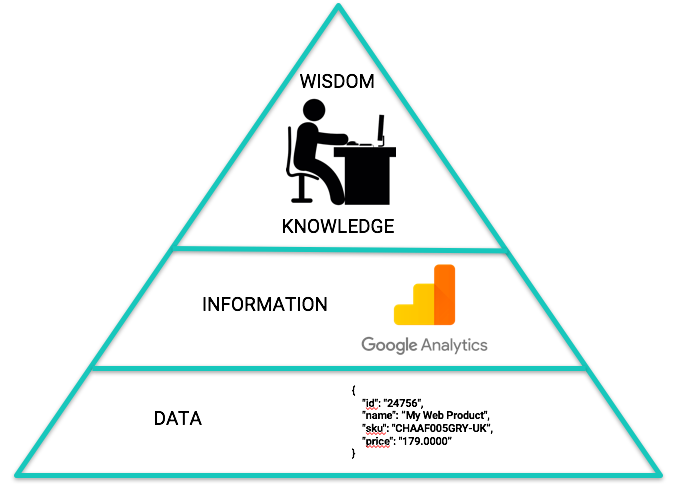 Computers are much better at the information processing part when given the right questions to ask – questions which are pretty standard in the web analytics domain. 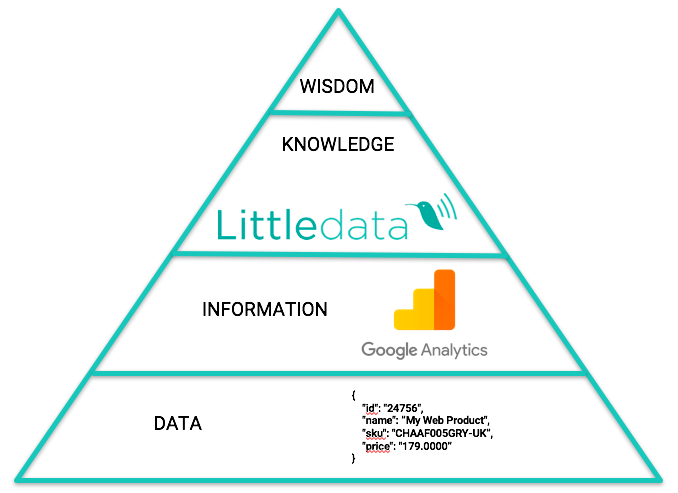 So Littledata is extending the machine capability up the pyramid, allowing human analysts to focus on wisdom and creativity – which artificial intelligence is still far from replicating. In the case of some simpler insights, such as bounce rates for email traffic, our existing software is already capable of reporting back a plain-English fact. 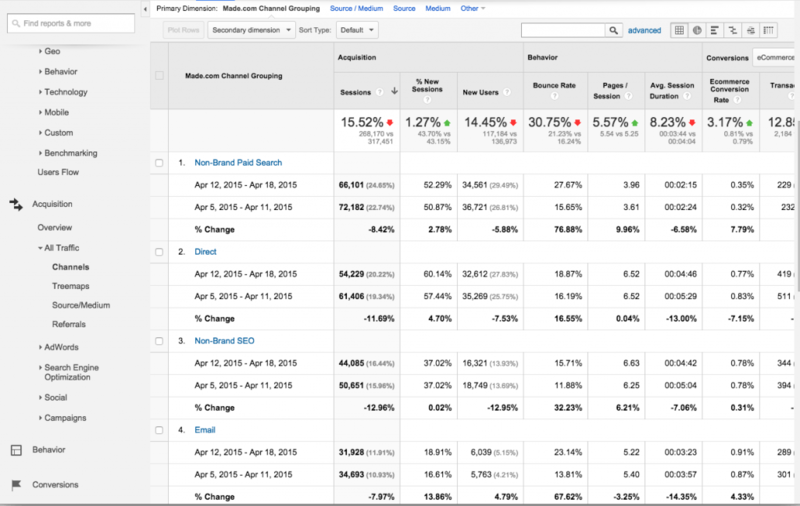 Here’s the ‘information’ as presented by Google Analytics (GA). 1. How do users typically flow through my website? 2. How does my marketing channel mix contribute to purchasing? Neither yields an answer to the “how” question easily! Beyond that, we think there is huge scope to link business strategy more closely to web analytics. A visualisation which could combine a business’ sales targets with the current web conversion data, and with benchmarks of how users on similar sites behave, would give managers real-time feedback on how likely they were to outperform. That all adds up to a greater value than even the best data scientist in the world could bring. Have any questions? Comment below or get in touch with our team of experts! Want the easier to understand reports? Sign up!